Here I am again, behind with my scrapbooking. I can’t do the 15 minute daily scrapbooking that people suggest to stay on top of things, pick photos, Photoshop photos, select papers and embellishments, then scrap. I like to 4+ hour blocks of times to get my mind into it and justify the mess that I make pulling everything out… stamps, punches, ink, papers, glue, photos, etc. Price is gone for the next 2 weeks so I have opened up a folding table in the living room and yanked my stuff out. Ah joy. He is completely justified for being annoyed with the mess I make since I make a massive mess. So I am missing my Pricer but completely enjoying the fact that I don’t have to worry about him tripping over 2 paper organizers, 1 rolling scrapbook organizer, and a scrapbooking tote. I went to CKC Manchester this year in May and had a blast. I enjoyed the time I classes I took and shopping the vendor faire. 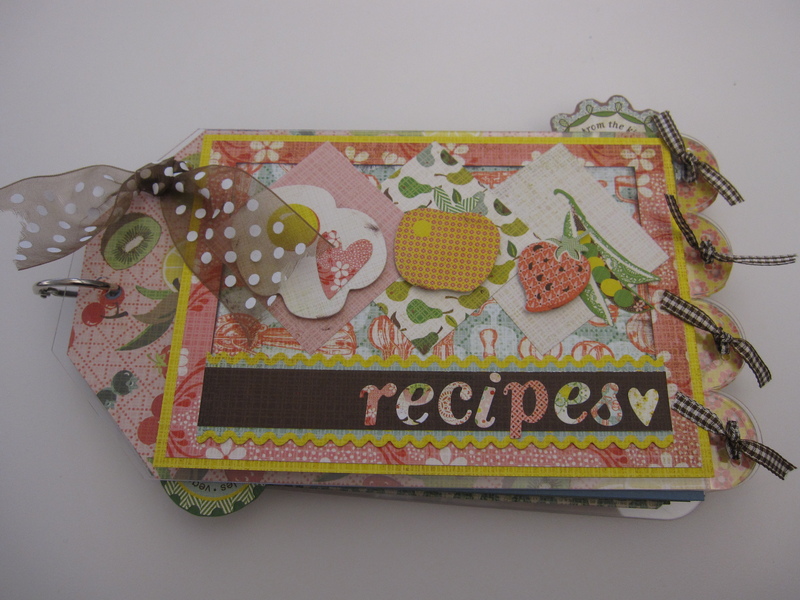 Once of the classes I took was for this mini acrylic recipe album. I loved the papers that were selected. I liked the design direction for the book was going but since have the innate need to make something my own I did not follow them, with the exception of the cover. Sometimes this gets me in trouble but for creative projects like this it usually works. I just don’t want everything looking just like everybody else’s. The plan for the album was to us the acrylic pages as the only pages in the album. Since I wanted more than 5 I decided to add more pages to have more recipes and more photos. 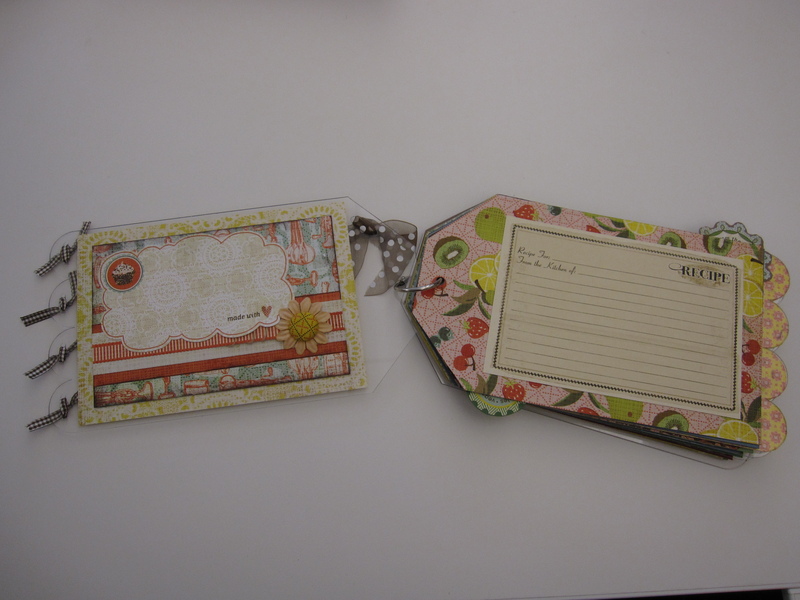 In addition to the patterned paper provided, I used Stampin’ Up! solid papers to fill in the gaps and added the paper and embellishments to them. 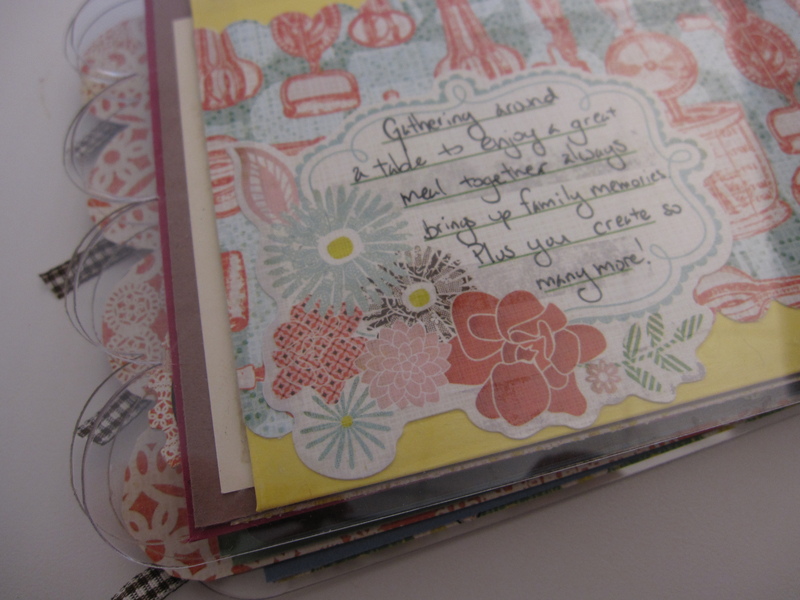 I punched them with a scalloped border punch to mimic the scalloping on the album. I like working with acrylic albums because of the peak you get for what is coming ahead. 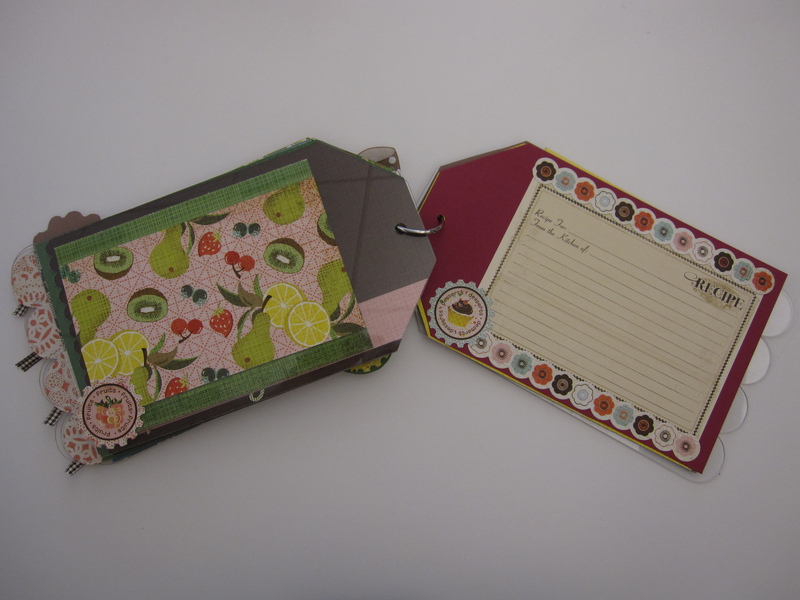 It can be tricky to coordinate things since both sides of paper and embellishments are seen. I’m careful to pick papers that interesting papers on both sides. Also, when using stickers I try to using simple shapes ones and back to back them so you don’t see the back of one if you position it on the acrylic. I like the pocket in back because it rises above the acrylic, giving you a peak, and it can hold little mementos. On the back of the pocket I put a journaling sticker. I wrote a message on there and then adhered the whole pocket to the back, allowing the message to be seen through the acrylic. 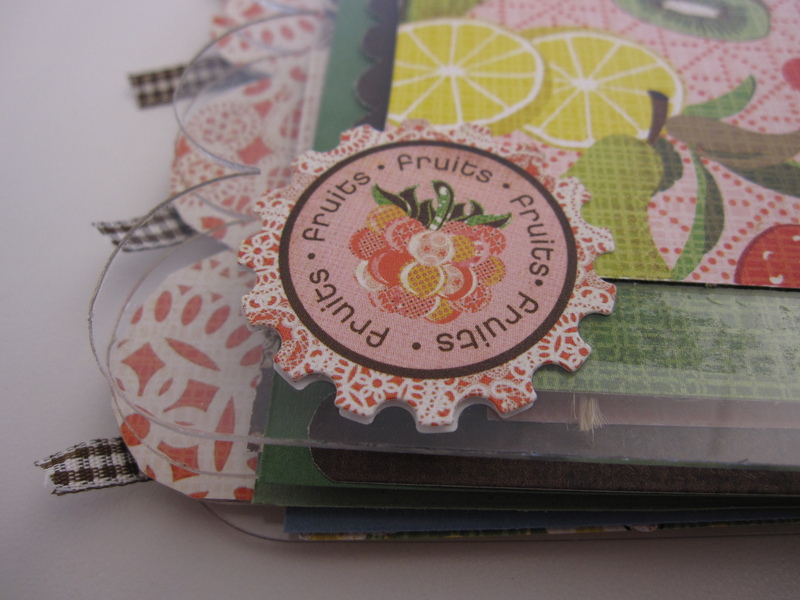 The colors of the papers and the style of the stickers seemed like it would be best for Thanksgiving. Plus, Thanksgiving is one of my favorite family gathering events that generally revolves around food. I’m looking forward to filling this in with Thanksgiving photos and recipes over the years. I expect this album to continually be a work in progress as I add in photos and new family favorites.